When Joy had a personal trainer, the trainer would write down the routine for the week, a sort of homework assignment, which was often hard to decipher. (“Standing straddle forward bend,” anyone? ) A new iPhone and iPad app from PumpOne is a really great tool for trainers and exercisers. “FitnessBuilder PRO 3.1” lets trainers create workouts on the iPhone or iPad and share them with other iPhones and iPads, or email them as PDFs. The app can also take the place of a personal trainer, through hundreds of videos, images, and workout routines. These include all the hard-core free-weight exercises, as well as things like yoga, Pilates and calisthenics. There are also areas for recording personal statistics and accomplishments. 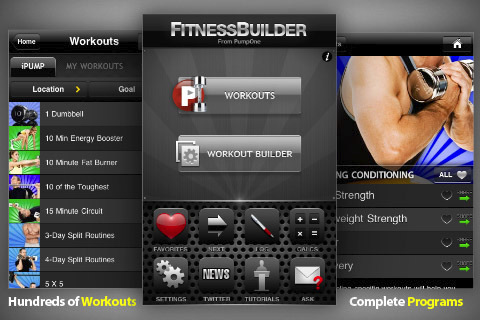 FitnessBuilder is $10 for iPhone or iPad. For more exercises, (up to 5,600), there’s also a monthly subscription. More info at PumpOne.com.